J and I hosted the inaugural “Friendsgiving” party with our close friends this past weekend. Each gal was entrusted with bringing a crucial dish to complete our feast. Being the hosts of the gathering, I offered to take on the task of the turkey, stuffing and a side dish. I didn’t realize how time consuming it was to make a roasted turkey with stuffing! It was literally a two-day long affair. My parents have always been the family members to host Thanksgiving lunch for our entire family, so mom came over to show me the ropes- the literal ins and outs- of the turkey and how to roast and stuff it. Thanks to her, the turkey and stuff coming back exactly like it does every Thanksgiving at their house. This year we are spending Thanksgiving with J’s family, so it was nice to be able to enjoy the traditional meal I’m used to. Accompanying the meat were brown sugar carrots, green bean casserole, broccoli and rice casserole, mashed potatoes, gravy, and bread rolls. For dessert, pumpkin and chocolate cheesecake with homemade whipped cream. 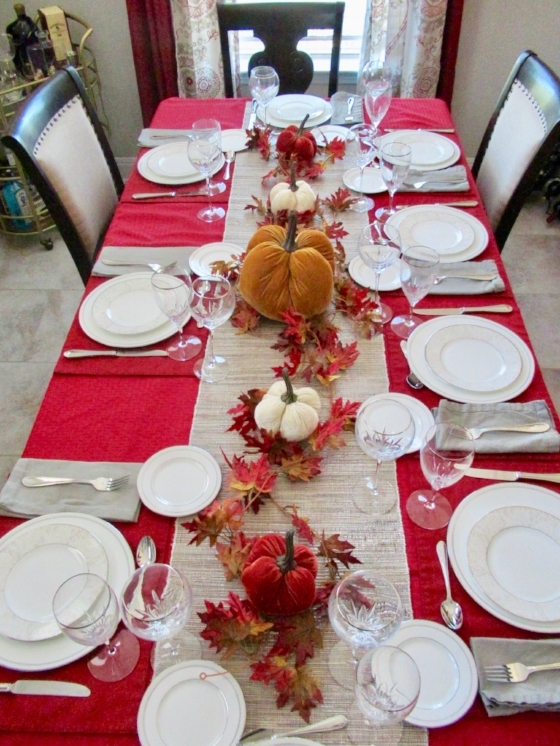 Something also worth mentioning was how proud I was of my tablescape this year. As most people I know begin to put up their Christmas decorations, I have kept our fall decorations up, not only because of the dinner party, but also because of the fact that it’s still fall, y’all! I stumbled upon these velvet bean-bag pumpkins at the Nutcracker Market in Houston. Although pricey, I’m so glad I purchased them. They completed the table perfectly! I also pulled out our wedding china to use since it was a special occasion. I love our china patterns! I bust out the dishes and plates every now-and-then since I enjoy them so much.